The Sewemup Mesa trail is located along the Dolores River just off of Highway 141 between Gateway and Naturita, Colorado. From the highway the trail makes a short climb up to a placer claim that it passes through before beginning a steeper climb up a cairned route that takes it to a grassy knoll overlooking the canyon below. 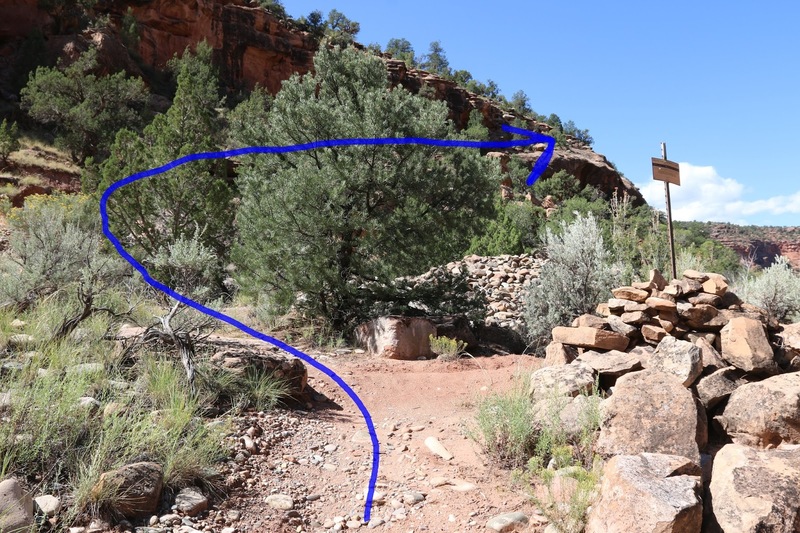 The cairned route ends at this point but hikers can continue to explore Sewemup Mesa although it will be without the aid of any well defined trails to follow. 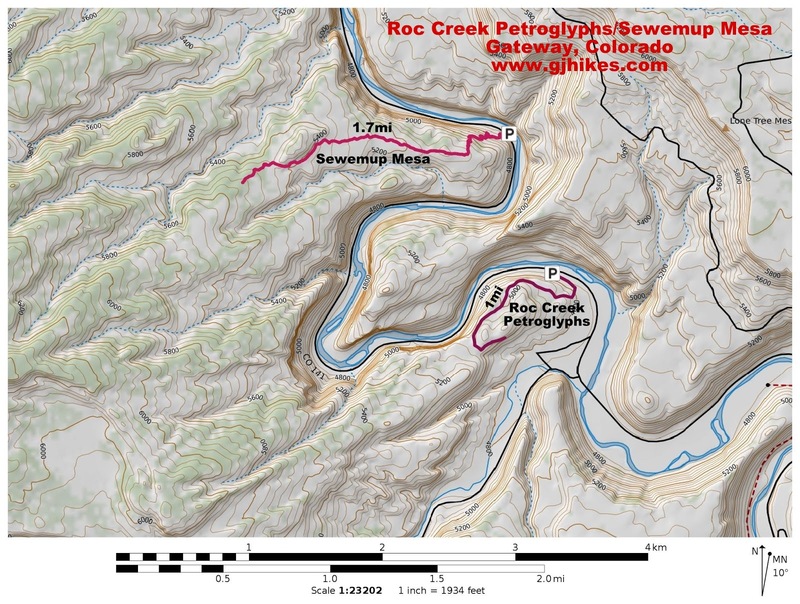 The unmarked trailhead is located 19 miles south of Gateway on Highway 141 and 32 miles north of Naturita about a quarter mile north of milepost 92. There isn't a good pullout or place to park other than to pull completely off on the side of the road well out of the way of traffic. 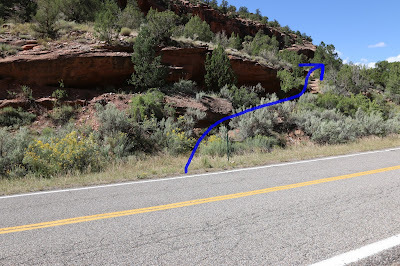 After climbing up onto the little rise above the highway the trail cuts through the placer claim and begins angling up the cliff to the right. The trail is faint from not getting much use but it is pretty well marked with small cairns. Most of the trails current use seems to be as a game trail. 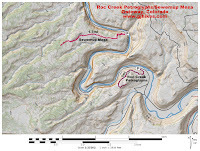 This is one of the only routes for deer to get from Sewemup Mesa down to the Dolores River for water. The trail is slightly challenging with a little exposure to mostly short falls in places but mostly its just kinda fun looking for the cairns and working your way up the cliffs. There are probably more than a few places where you have to use your hands and stretch your legs to get up the ledges and over small boulders. Once the trail reaches the grassy knoll it pretty much disappears. We only noticed one more cairn past this point that was where the grass meets some slickrock a little further up. We kept going for at least another half mile but this is probably a suitable turnaround point for most people. If you do continue there are a couple of long sections of slickrock that are followed by lots of red dirt. The slideshow at the end of this post shows most of what we came across before we turned around. Once you get up this high on the mesa most of what you can see is looking out over top of everything else. Without getting well off the trail the best bet for seeing the floor of the canyon and the Dolores River is while going up and down the cliffs above the trailhead. 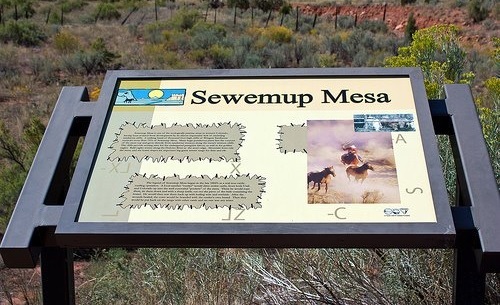 The story of Sewemup is an interesting one that dates back to the 1800's when cattle were rustled both from around here and all the way over into Utah. The spot with the brand was cut out and sewn back up with bailing wire and rawhide. Once the hide healed the cow was rebranded with the rustlers brand while supposedly nobody was any the wiser. If you like scrambling up short cliffs and hunting for cairns then you might find the Sewemup Mesa trail enjoyable. Of course, there are enough cairns that they are more like looking for Easter eggs that were left in plain sight for the toddlers to discover. We didn't know anything at all about the Sewemup Mesa trail until we saw it listed in a pamphlet that we bought at the Naturita Information Center. Once we saw it we couldn't help but to check it out for ourselves. If you would like to see it for yourself then all you have to do is 'Take a hike'.